Interested by the idea of steam-powered locomotives, on July 25, 1814, George Stephenson completed his own model, the Blucher. Even though the Blucher drove at a snail’s pace, it was a significant improvement over prior locomotive models. Those models did not utilize the waste steam, letting it blow away into the air. Stephenson redirected the exhaust steam from the cylinders through the smokestack, which in turn created a larger draft, increasing the temperature of the fire used to boil the water for the steam. Steam locomotives have been used for over two centuries. The first notable and somewhat practical one was built by Richard Trevithick. It worked, to be sure, but without fail on every trip it took, its massive weight snapped the rails. However, it was the first railway locomotive, and opened up the era of steam engines — the Blucher being among the first. While not exactly impressive, it could haul thirty tons of coal at a walking pace of 4 mph uphill. The Blucher, however, earned Stephenson a reputation and marked the beginning of his famous locomotive career. But Stephenson did not stop at the Blucher. He next built another famous engine, the Locomotion. This proved a success, and was used on a railway he built between the towns of Stockton and Darlington in England. The Stockton-Darlington line only used steam-locomotives for part of the journey. For the remainder of the way, carts tied to ropes were reeled in by fixed steam engines much further down the track. But it was the Rocket, which Stephenson built for the Liverpool-Manchester Railway that truly ushered in the era of steam locomotives. With its high-quality construction, its use of pipes running through the boiler to carry heat, increasing the boiler temperature and thus the amount of steam produced, and using the same draft design to heat the fire that was used in the Blucher, Stephenson manufactured the predecessor of all modern steam engines. Not only that, but in 1829, in the famous competition to determine which locomotive would be used for the Liverpool-Manchester Railway, the Rocket came out with flying colors, being the only locomotive to even complete the competition! Building a steam engine that actually produced a rotating motion which could propel locomotives was a feat on its own. In the first century AD, the Greeks invented the aeolipile — a rotating globe with nozzles on it that expelled steam something like a rocket to keep it moving. Useful? Absolutely not. It was merely a novelty item, and could drive no load. Many engines were built in the eighteenth century that produced an up-and-down motion, and were limited to use as water pumps. None of them had very good horsepower, and none of them actually created a rotating motion. Not, that is, until James Watt came along with a very simple idea. Taking a large flywheel, and attaching a cylinder to an offset shaft on the flywheel, he turned the push-pull motion of the cylinder into a rotary motion. Unfortunately, someone shamelessly stole the idea and patented it. However, when the patent on the stolen idea expired, designers used Watt’s flywheel method ever after. On a steam locomotive, the flywheel is actually the locomotive’s driving wheel! Create a timeline listing the progression of inventions that led to the steam locomotive. Draw an illustration of Watt’s flywheel. Explain how a steam locomotive works. Great timeline including illustrations of the various milestones in railway development. A ThinkQuest look at the history of the steam locomotive. 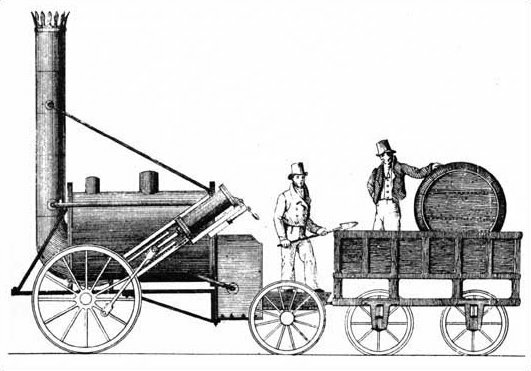 An illustration of Stephenson’s Rocket. Read about the Tom Thumb, America’s first steam locomotive at Eyewitness to History. A look at how steam engines work. Animated engine that illustrates the process. Interactive from the BBC where you watch an animation of the Rocket and then build it! Wonderful story about the Stephensons and the locomotive in the public domain. Public domain book adapted for younger readers from a larger work by the same author. A chapter from Great Inventors and Their Inventions by Frank P. Bachman. A chapter from Great Englishmen by Dorothea Beale. Part of our free science studies with more resources not included here. Simple notebooking page for copywork, narrations, or wrapping up. Need more room? Add a car. This is not a free resource, but an inexpensive notebooking option from Notebooking Nook designed to go with the book Great Inventors and Their Inventions by Bachman mentioned above. If you plan to follow the entire book, you may be interested in the complete set.